The environmental sensitivies of cold-water corals and their associated biota are likely to be determined by the natural variability of the cold-water coral reef environment. The sensitivity of reef biota to sedimentation and resuspension events is largely unknown and the influence of seasonal phytodetrital deposition is poorly understood. Here we describe the use of a benthic photolander to monitor this variability by the Sula Ridge reef complex on the mid-Norwegian continental shelf and from the Galway carbonate mound in the Porcupine Seabight. The photolander provides a platform for time-lapse digital and film cameras to image the seabed while recording the current regime and optical characteristics (light transmission, backscatter and fluorescence) of the seawater. In its first two deployments carried out in 2001 and 2002 by the Sula Ridge the lander recorded a dynamic environment around the reef site with a tidal current regime and periods of sediment resuspension. Current speeds by the Sula Ridge reef complex reached a maximum of 28 cm s−1 and 70 cm s−1 on the Galway carbonate mound, reinforcing much speculation about the dependence of these communities on current-swept conditions. Seabed photographs show intense feeding activity of echiuran worms (Bonellia viridis) near the Sula Ridge reef complex pointing to rapid bioturbation of the sediment. Fish were recorded sheltering near sponges that had colonised glacial dropstones. Longer term monitoring in situ is needed for study of seasonal change, to identify functional roles of associated fauna and to monitor potential coral spawning events. Benthic landers and seafloor observatories have great potential in these areas. 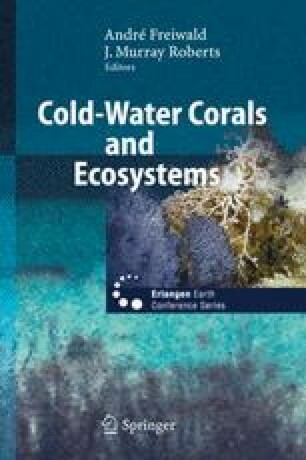 Only with a better understanding of the natural variability of the cold-water coral environment can informed decisions about the environmental sensitivity of cold-water coral reefs and their management be made.